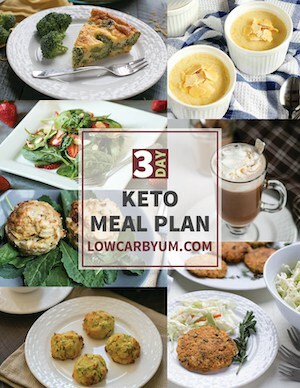 Want the best fish tacos recipe to enjoy on a keto low carb eating plan? 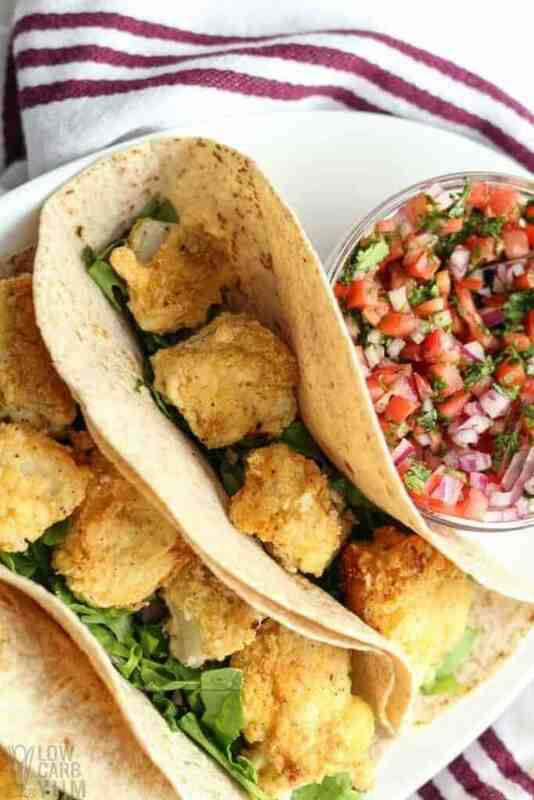 These healthy healthy fried fish tacos are quick and easy! Love fried breaded fish served in tortillas? 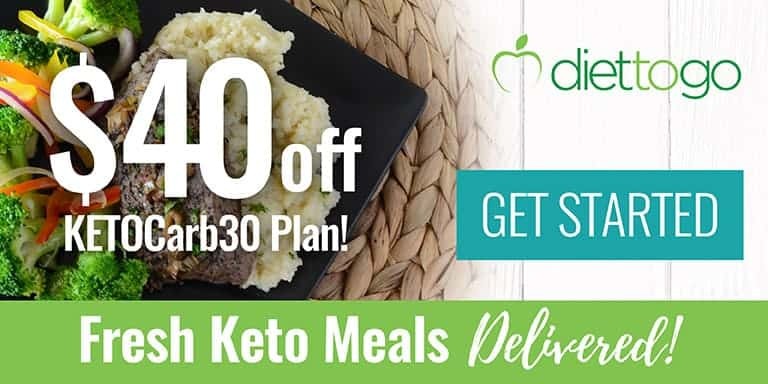 There’s no need to miss out! Even though tacos are often high in carbohydrates, they can easily be made keto friendly. 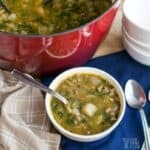 And once you give them a try, they are sure to become one of your favorite low carb Mexican recipes! The flaky fish, with a crispy outside, makes the perfect base for the delightful tacos. I literally don’t remember a time that these didn’t hit the spot when craving a yummy taco. There is just something so tasty about fish tacos, easily making them one of my favorite taco recipes. I will warn you though that these are delicious and you might have to keep yourself from going back for seconds and thirds. 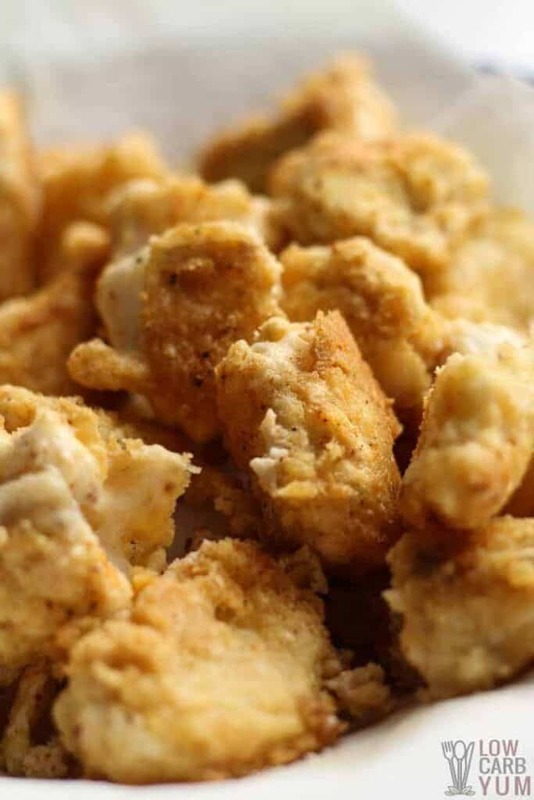 The whey protein, baking powder, salt, chili powder, and cayenne pepper (if using) are whisked together in a medium sized bowl for the low carb breading. In another bowl, the eggs are beaten. Next, the cod is diced into bite-sized pieces. Then it’s dipped into the dry mixture followed by a quick dip into the beaten eggs. Finally, it’s dipped back into the dry mixture. The process is then repeated until all the fish pieces are well coated. A large skillet is used to fry each piece in hot oil about 1/4 to 1/2 deep. It takes about 3-5 minutes to cook each side of the fish to a golden brown color. When fully cooked, the fish should flake easily. 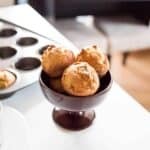 If you’d prefer, an air-fryer could by used to reduce the amount of oil and make less mess. The fish could probably be baked in the oven as well. I’d suggest cooking at 350°F in the air fryer for 10-12 minutes and flipping half-way or giving a little shake. In the oven, I’d try either 375°F or 400°F for about ten minutes or until browned. 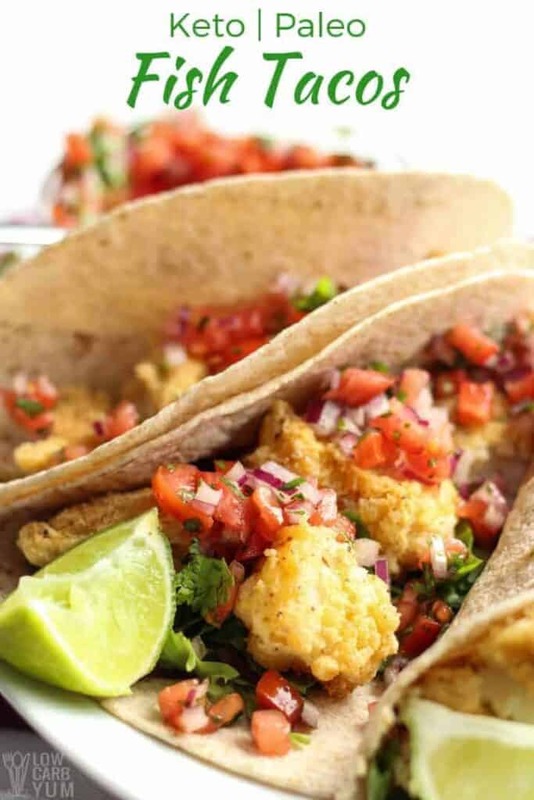 The fried breaded fish are best served with homemade keto-friendly gluten-free tortillas along with Pico de Gallo and a few lime slices. Or try serving them with some cucumber salsa which has less fruit sugar than those made with only tomato. 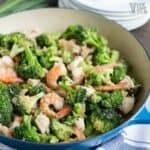 The taco mayo sauce I use for serving burnt broccoli is another great option! If you don’t have any low carb tortillas made, that’s perfectly okay. The recipe can be made served without the tortillas and enjoyed as a paleo fish taco bowl. Or, just enjoy them as fish lettuce wraps. 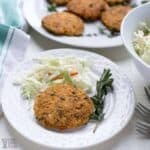 These cod fish tacos are great as a lighter lunch or you can add sides to it for a full dinner. 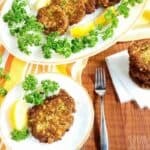 And they are so delicious that even your non-keto friends and family will love the recipe. 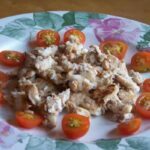 Want a healthy fish tacos recipe to enjoy on a keto low carb eating plan? These fried fish tacos make a quick and easy lunch or dinner! 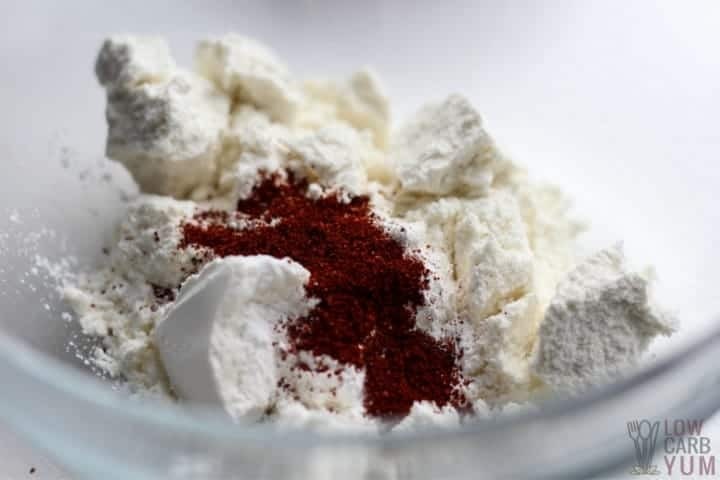 In a medium size bowl, whisk together whey protein, baking powder, salt, chili powder and cayenne pepper if using. In another medium size bowl whisk eggs. 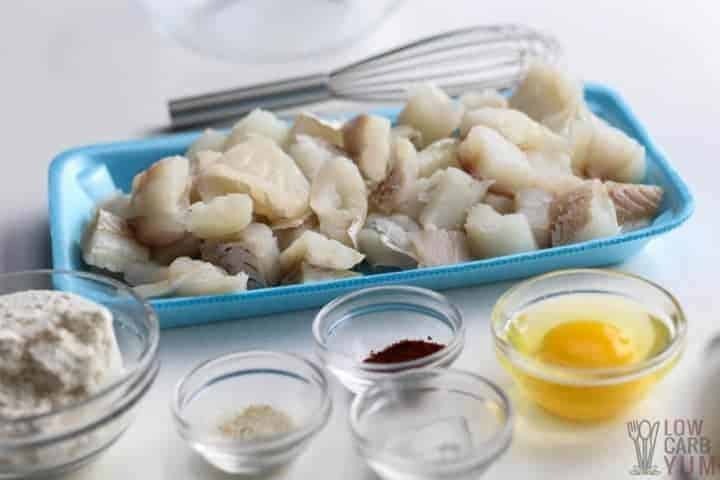 Cut cod into bite sized pieces. Dip cod into dry mixture followed by the egg and back into the dry mixture, coating all sides. Repeat until all cod has been coated. Over medium high heat, heat up ¼”-½” of oil. Carefully place cod and allow to cook 3-5 minutes per side. If fish is cut thicker, allow time to cook accordingly. You are looking for the coating to become a golden brown color. Remove from skillet and place on paper towel. Add in next batch of cod until all has been cooked. Serve with lettuce or salad mixture, pico and squeeze of lime juice. 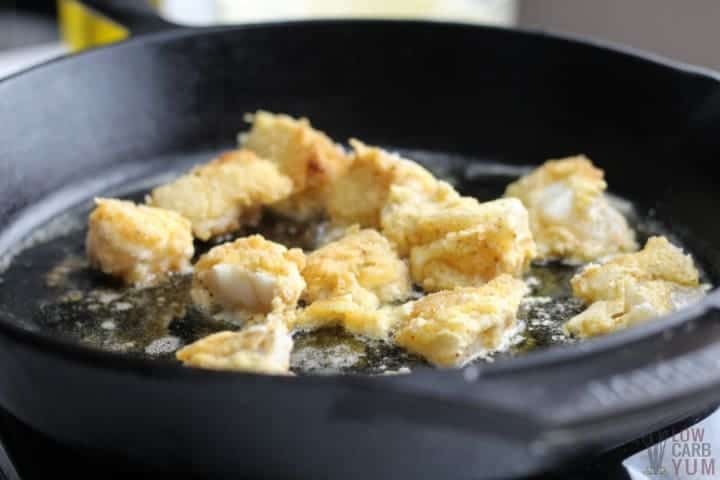 Make sure your skillet is hot before cooking the fish to ensure a nice, crisp finish. 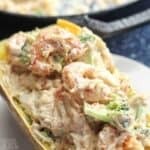 Fish tacos are one of our favorites so naturally I had to give this keto friendly version a try! They’re so tasty! We’ll definitely be making them again. 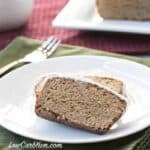 What is an alternative to the whey protein powder in this recipe? I’ll edit the recipe with subs as almond flour or crushed pork rinds should work as well. 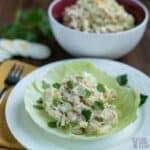 What changes would I need to make in fish tacos if I don’t have whey? 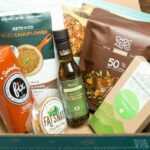 I’d just try using finely ground almond flour or crushed pork rinds. 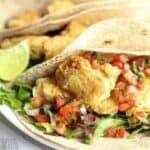 I love fish tacos and really want to try this recipe. Can something else other than Whey Protein be used? I don’t normally buy or use it. Almond flour or crushed pork rinds should work too.